Police are looking for four suspects who robbed a man at gunpoint at his home in Olney on Wednesday afternoon. It happened around 3:15 p.m. on the 5400 block of North 2nd Street in Philadelphia. 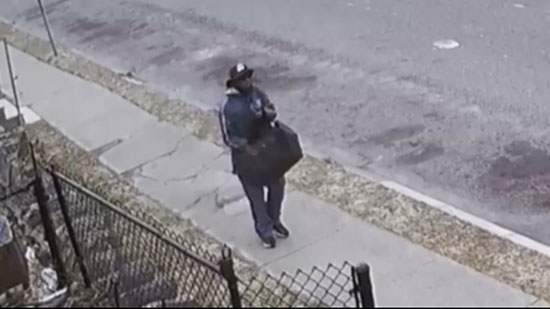 44-year-old Khamphoy Detmongkhoune had just placed his child in the car when a man dressed as a postal worker walking down the street pulled a gun. The suspect forced him back into the home. This was all captured on surveillance video. Three more suspects ran to join them. The man was zip-tied and pistol whipped. They ransacked the home and made off with $5,000, an iPhone 7, and the victim's house and car keys. They fled in a black Buick Lucerne sedan and a grey Pontiac sedan that were waiting. The child was unharmed. Anyone with information is asked to contact Philadelphia police. Police are investigating after an elderly man was struck and killed while crossing the street in North Philadelphia on Thursday. It happened around noon Thursday on Allegheny Avenue. The 78-year-old man was crossing the street when he was hit by a grey Volvo going eastbound. The driver did stop. The man was taken to Temple University Hospital where he was pronounced dead at 12:41 p.m. No charges have been announced. The trial began today for a man charged in the ambush shooting of a Philadelphia Police officer in West Philadelphia two years ago. 32-year-old Edward Archer confessed to police that he shot Officer Jesse Hartnett in the name of ISIS. Archer fired 13 shots while Hartnett was sitting in his patrol car at 60th and Spruce. He was struck 3 times, shattering his arm. Hartnett returned fire and was able chase Archer down. Today in court, Archer refused to enter a please saying, "I don't plead to anyone but Allah." Judge Leon Tucker then entered a plea of not guilty. The prosecution and defense both presented opening statements. The high profile trial is expected to last two weeks. The Museum of the American Revolution at 3rd and Chestnut Street in Old City Philadelphia is getting into the Super Bowl spirit. Today, they unveiled a temporary name for one of their galleries. 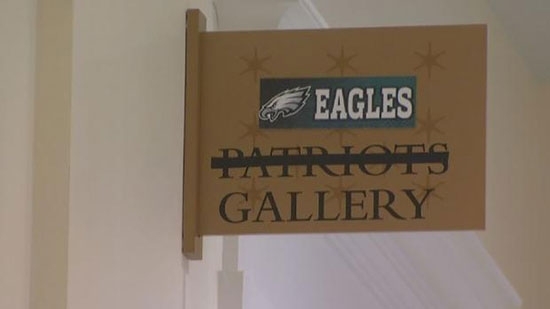 The "Patriots Gallery" will known be known at "Eagles Gallery" through the big game. (see photo below).